Husb and I spent a lovely couple of hours at a performance of “Swansea Jack”, researched, written and performed by the talented storyteller Carl Gough. We people from Swansea are nicknamed “Jacks”, supposedly after the heroic black Labrador dog who saved many people from drowning in the 1930s. 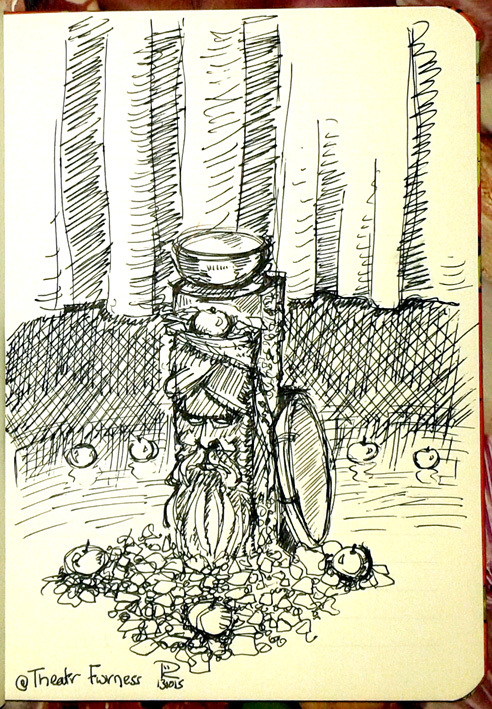 Of course, I had a quick scribble, in my little red cloth covered sketchbook. I used a ballpoint pen, I love them for quick sketches because they flow so easily. Just back from a culture vulture evening, with the opening of two exhibitions, at Galerie Simpson and Volcano and the monthly Storytelling at Tapestri. Swansea is buzzing with arty shenanigans tonight. Of course, I had to have a bit of a scribble ……. Husb and I are just back from storytelling night at Tapestri, a regular event with a different mix of performers each month. It’s in a old courtroom that’s been renovated and used now for art and culture, although they’ve kept the raised boxes for the judge and defendant and there are some very comfortable jurors chairs too. There are always lots of interesting faces to draw and these elder women were sitting, rapt, in front of a vast modern stained glass window. 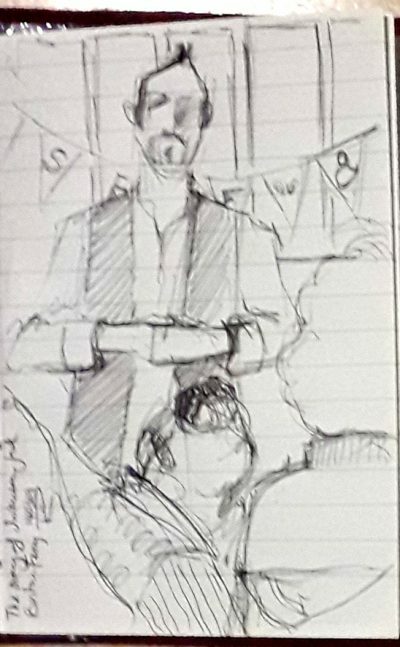 I usually have my sketchbook on me so I had a quick scribble while I listened to West Wales teller, Nick Brunger and his riveting Gothic tales. I have been travelling across South Wales with Rhondda-born archaeologist Dewi Bowen and Swansea film maker Melvyn Williams, hunting the wild megalith, accompanied by my portable drawing board, portfolio of Fabriano paper and a bag full of assorted artist’s materials. Dewi is researching his latest book on Neolithic monuments and Melvyn is making a documentary film of our literary and artistic adventures. If you want to know more about my solo show in The Worker’s Gallery in the Rhondda Valley in September, please click here. And if you want to see some of my other artwork, please click on the image below. Just back from a great evening of storytelling at Swansea’s Tapestri art centre. I did a couple of quick sketches of the performers. It’s harder to sketch someone who’s moving but very good practice. The storytelling is a regular event on the last Friday of each month. I’m currently working on a series of expressive drawings of ancestral sites and if you want to see some of my other artworks, please click here. I used a biro pen into my new Cat’s Meow Journal from Peter Pauper Press. I was ‘babysitting’ our ‘Commensalis‘ exhibition in Bath on Thursday, sitting opposite one of the old chapel windows and looking at my reflection against the torrential rain outside. 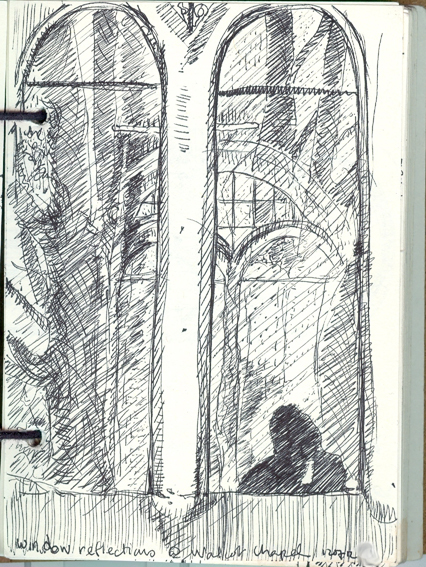 During the quieter moments I sketched what I could see. It wasn’t easy because the layers that you see in a reflection are all squashed together. Does that make any sense? It isn’t the same as looking out across the real view. The depth of field is different, so I had to come up with lots of different marks to differentiate between the different layers of what I could see and to try and make sense of the drawing. One of the nice things about being an artist is that you stop and look for much longer than most people and the more you look, the more you see. I like the way the reflections merge into each other and some bits disappear and give way to others. This is drawn with a Pilot V5 hi-tecpoint 0.5 pen into my recycled A6 leatherbound sketchbook. I haven’t had much time on the computer because of the exhibition and my RSI has improved a lot, but it’s still there, niggling away so I’m going to have to be a bit careful for a while. I’d rather do less on Twitter and Facebook than do less drawing and art.